So, finally I’ve found time to start a new approach of migrating older Zend Framework (ZF) 1 projects to ZF2. To get most out of ZF2 and its new modular design I’ve decided to simultaneously try out the Doctrine 2 ORM module. These are the steps I’ve used to integrate Doctrine 2 into ZF2. First off, setup your skeleton ZF2 project as usual. Using Netbeans (or any IDE of your choice) download the ZendSkeletonApplication and create a new project. You will also need to setup composer to manage your ZF2 project – so do so as well. Warning: This development build of composer is over 30 days old. It is recommended to update it by running "composer.phar self-update" to get the latest version              . This sets up your dev environment by downloading ZF2 into your project’s vendor folder. Based on the shiny new modular design composer also suggests to install additional modules, such as ext-intl and doctrine-annotations. We ignore theses suggestions for now and continue to install the Doctrine ORM module first. I cannot find the autoloader of the application. Since doctrine-orm-module requires doctrine-module we include it explicitely. Optionally, you could use specific vesions for both modules but since this is a plain dev project dev-master is just fine. Make sure to use specific versions for production environments! 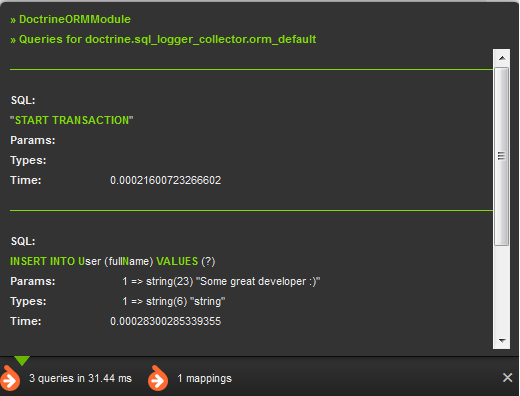 Next, we need to actually setup our shiny new Doctrine 2 module. Note that you can also simply put the database connection details in local.php and/or global.php depending on your environment (dev vs production) but I tend to seperate these configuration options into different files. and activate by configuring bjyprofiler.local.php in autoload. As specified by the paths option make sure to put Entity files in src/Application/Entity for the Application module. As you can see the dynamic mapping already works! Want to know how to generate Entity model mapping classes at ease based on YAML files? Then read on: Using YamlDriver to generate Entity model mapping classes via YAML files. zend framework 2 or without doctrine? which is recommended? how do i configure modules so i dont have to copy/paste doctrine config for each module?